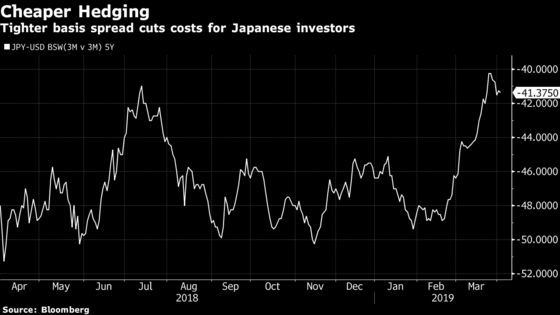 (Bloomberg) -- Japanese banks, some of the biggest buyers of top-rated collateralized loan obligations, have a fresh reason to snap up the structured products: cross-currency hedging costs are getting cheaper. That may help buoy the Japanese bid for AAA-rated CLO tranches, and offset a recent spate of concern over whether those investors could roil the market if they ever stopped buying. The dollar-yen 5-year cross currency basis swap -- what many Japanese banks are said to refer to in order to determine their U.S. CLO investments -- has cheapened by at least 8 basis points since the start of this year, and is currently at 41.3 basis points. Now compare that to February 2018, when the 5-year JPY/USD basis spread was much wider at 60 basis points -- a 19 basis point difference compared to today. And that was at a time when AAA CLO spreads were significantly tighter, averaging 100 basis points or less over Libor. AAA spreads for CLOs with anchor Japanese investors now average about 132 basis points over. A quick back-of-the-envelope calculation using those numbers illustrates the clear benefits of cheaper hedging costs. In February 2018, when average AAA CLO spreads were at about 100 basis points over Libor, and the basis spread was at 60 basis points in order to hedge, that would net big Japanese buyers such as Norinchukin Bank about 40 basis points after hedging. Today, when they can buy a AAA CLO offering about 132 basis points over Libor, and they’re paying about 41 basis points in order to hedge, the same trade nets them about 91 basis points.